The Royal Ballet is marking the 20th anniversary of Kenneth MacMillan’s death with a triple bill of his shorter ballets, two of them quite familiar from recent programming but the third – his Lorca-inspired Las Hermanas – providing a novelty both for the dancers and for many in the audience. It’s an interesting evening, showing both choreographer and company at their best and at somewhat less than that. Sarah Lamb and Ryoichi Hirano in Concerto. The weakest piece is the opener, Concerto. It’s set to the second piano concerto of Dmitry Shostakovich (here played by Kate Shipway), and MacMillan made it in the early days of his time as director of the Deutsche Oper Ballet in Berlin, reputedly to help teach that company the discipline they would need when they tackled the nineteenth century classics. One would hope that the Royal Ballet doesn’t need that sort of on-stage class by now, and I assume it survives in the repertory on the strength of its central pas de deux – beautiful, hushed and hypnotic, though slightly sentimentalised by the intrusion of three demi-soloist couples who add nothing to the mood and on this occasion distracted by their lack of coordination. (Maybe they do need the discipline…) Sarah Lamb took the role originally danced by Lynn Seymour and inspired by her total absorption as she worked at the barre: Lamb’s dancing is beautiful but a little too self-consciously so, missing the dance-as-if-no-one-was-watching feeling, and her enjoyment of what she’s doing seems intellectual rather than sensuous. Ryoichi Hirano was her excellent partner – strong, reliable and self-effacing, exactly what is needed here. Yuhui Choe and Steven McRae were well matched in the first movement, both of them light, fast and accurate, and I was impressed by David Trzensimiech’s jump; in the fast finale the corps de ballet looked impeccable but Itziar Mendizabal, like many before her, was overstretched by the technical demands of the solo role. Unfortunately both of these sections were afflicted by the gentility into which the Royal Ballet can sometimes decline: very polite, very nice, but sorely lacking in character – I would love to see the soloists tear into the choreography, rough it up a bit, give it a grown-up edge which would pull it out of the tweeness which constantly threatens, and altogether convince me that the whole ballet would not just be better left to challenge younger dancers at school performances. 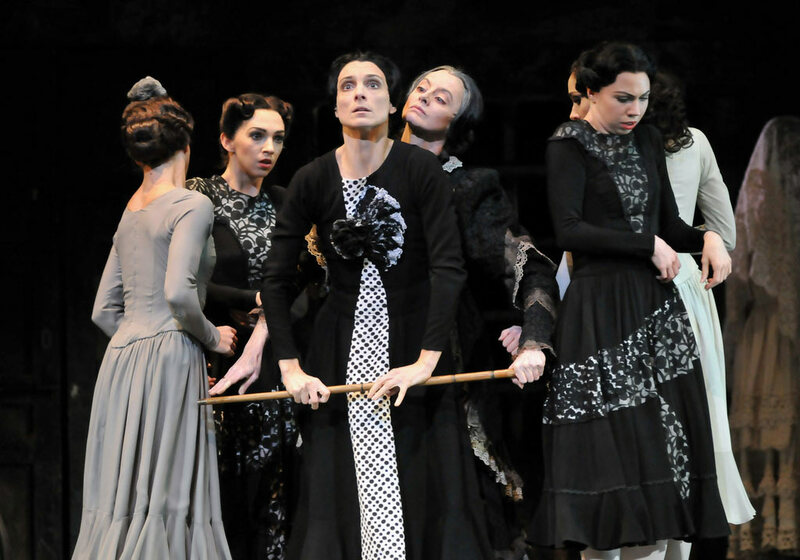 Laura Morera, Lara Turk, Zenaida Yanowsky, Elizabeth McGorian, Jacqueline Clark, Melissa Hamilton (behind) in Las Hermanas. Las Hermanas, to Frank Martin’s concerto for harpsichord and small orchestra, illustrates the opposite extreme of MacMillan’s range, as dark and disturbing as he gets. Although he created it for the Stuttgart Ballet it’s an obvious extension of the similarly claustrophobic works he’d been making for the Royal Ballet’s touring company, and it was mostly through that group’s performances that it became known over here. It’s the story of a widow who has found a potential husband for the eldest of the five daughters whose cloistered lives she totally controls, ending in tragedy thanks to the jealous interference of one of the other sisters. I believe it has been slightly revised for this run: the encounter between the man and the youngest of the sisters – right at the beginning, before the music starts – is new, spelling out their illicit relationship rather than letting it gradually emerge through whispered hints. Also I wondered if the man’s role has been somewhat toned down. I used to feel that his sleazy, cheap machismo would only answer the prayer of a very desperate maiden indeed: this time I didn’t see the nastily explicit pose which so precisely defined him, and in general he seemed less of a monster. But maybe that’s just the casting. Laura Morera and Melissa Hamilton in Las Hermanas. The dancers seize MacMillan’s expressionistic vocabulary almost greedily, and take it to its limits. Zenaida Yanowsky’s performance as the eldest sister is a brilliant portrait of repression and fear: her anguished hand-wringing gesture tells us everything we need to know. Tall, gaunt and despairing, she dominates the stage, and it takes everything that the man (Thiago Soares) and the jealous sister (Laura Morera) can do to compete with her for our attention. More performances will maybe even out the balance. The youngest sister (Melissa Hamilton) is the only one the choreographer allows to move freely and naturally. She pays for that, of course, and the ballet ends with the shock discovery of her hanged body – part of the shock for me being that I didn’t think MacMillan had shown us enough reason for her to take her own life, the only weak point in an otherwise very strongly constructed work. We don’t see enough from MacMillan’s pre-Romeo period and I hope this revival may encourage the company to show us more from that era. Carlos Acosta and Leanne Benjamin in Requiem. And finally Requiem, which for me owes its undoubted emotional pull to the dancers rather than to either Fauré or MacMillan. They seem to have taken this ballet completely to their hearts and dance it with dedication and seriousness and with a respect and care for each other which override the incongruity of some of the choreography and the false (to my ears) comfort of the score. A rewarding experience, even if not the one that MacMillan set out to deliver. re your point about the youngest Hermanas’ unrevealed motive for suicide: in Lorca’s play, Bernarda fires a shot at Pepe – and misses, as women do (she says). But the enamoured girl thinks he’s dead, so kills herself. I guess in MacMillan’s ballet, she goes further than The Invitation girl and dies of shame, despair, doomed spinsterhood… and lack of music to explain herself.